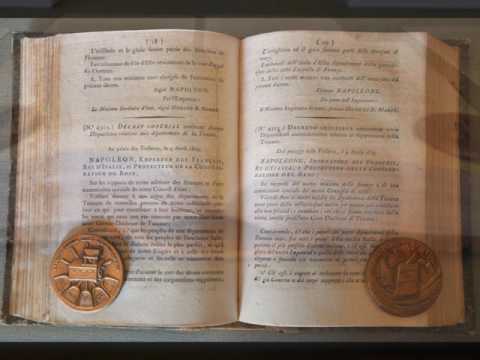 Inside the Library of the Accademia there is a collection that holds a special significance both for the history of the Accademia and the history of the Italian language: the collection of Citati. This collection groups together the printed texts quoted in the famous Vocabolario degli accademici della Crusca, published in five editions over more than three centuries, from 1612 to 1923. The knowledge that this collection’s history is fundamental to the Accademia’s own history drove the Accademia itself to pay special care and attention to the volumes that are part of it, through a project of valorization and preservation which led to the construction of the database called Fondo dei Citati, or Collection of Quoted Texts (www.citatinellacrusca.it). This database brings together materials originating from different operations, all part of the project called Valorizzazione e conservazione del Fondo dei Citati (Valorization and Protection of the Collection of Quoted Texts). The main aim of the project has been that of offering, along with the descriptive elements established to trace the editorial history of the work, also all the descriptive elements useful for rebuilding the life of the specimen. The database contains an analytical bibliographical record for every work belonging to the collection, which, together with the description of the details of publication, leaves a lot of space for annotations, especially those that relate to the specimen and its origin. Every record has been equipped with a digital scan of a representative sample of the pages of the specimen: for example the title page, pages containing hand-written notes, annotated pages and pages containing the portraits of the authors, with the purpose of showing all the significant traces left on the specimen through the centuries.